Idared flowers early in the season, so may be difficult to pollinate from neighbour's trees. A middle of the road taste, and reliably produces a heavy crop of fruit which keeps for an unusually long time. 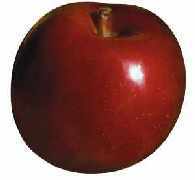 Idared is a very attractive looking apple with a bright red skin and even shape. Idared can be used as both a cooking and desert apple. It is particularly popular in Austria where it is used in cooking apple strudel because it retains its shape and is relatively sweet for a cooking apple. Relatively easy to maintain, although it is prone to mildew and may need some attention to prevent this. If you wish to buy this apple tree online from our recommended suppliers then click here.